Ordinarily, I avoid layovers like the plague. Especially layovers longer than 2 hours. But for my recent flight from the US to Australia, I purposely chose the flight with a 10 hour layover in Auckland, New Zealand. For starters, this particular flight option cost less than than those without a layover. Additionally, I thought it would be a cool opportunity to check out New Zealand since I’d never been there before. Logistically, the trip couldn’t have been easier. My flight arrived early, and I cleared customs in minutes. My bag was checked straight through my final destination, but Auckland Airport offers secure baggage storage for just $12 NZD. Directly outside the Arrivals terminal, I bought a roundtrip ticket for the Express Bus for $26 NZD, and 45 minutes later, I was in the city center. Easy peasy! 1. 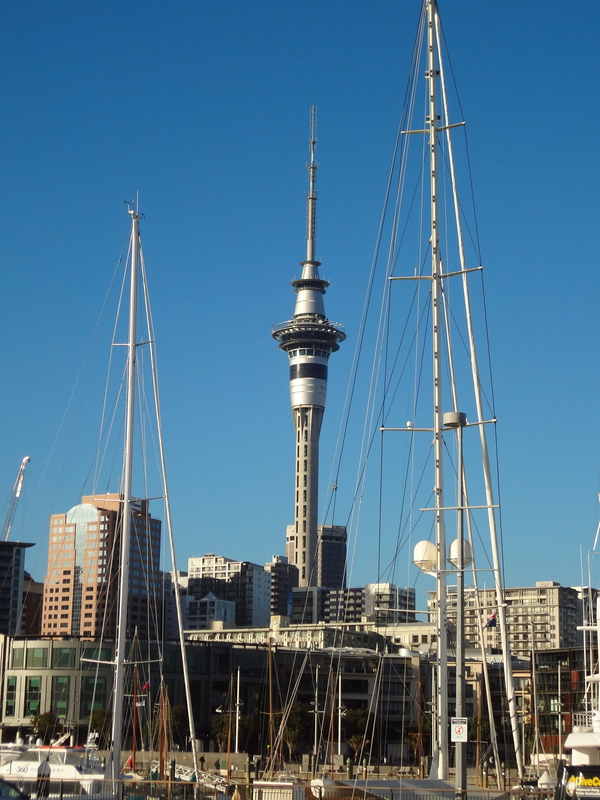 Enjoy a morning stroll through the Auckland Waterfront. The harbor and boats provide a lovely backdrop as the sun rises. The surrounding streets are full of shops to browse in, and restaurants to satisfy cravings. 2. Try a savory meat pie. After subsisting on airplane food for the previous 14 hours, a meal was in order! 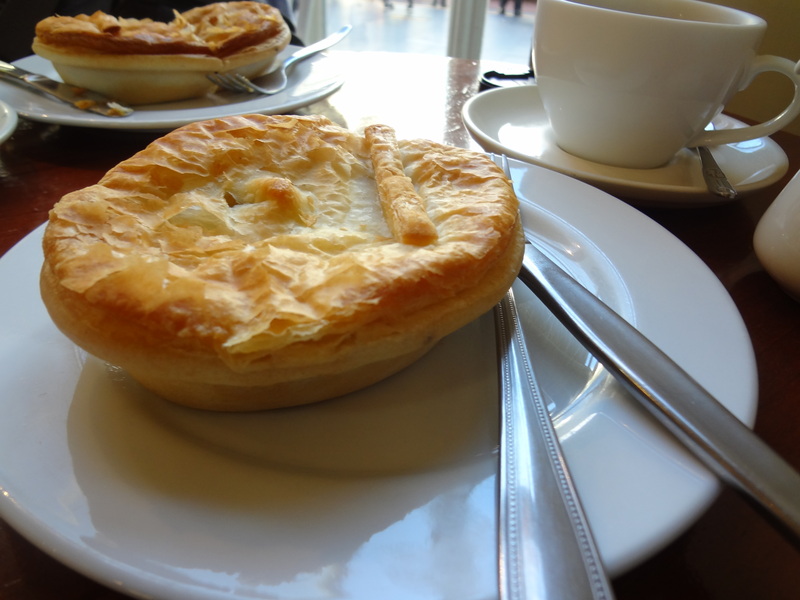 I tried the iconic New Zealand national dish, the meat pie. I opted for the lamb curry pie, which was pretty tasty. What’s not to love about stew covered with buttery Phyllo pastry? 3. People watch in Albert Park. It may be fall in the Southern Hemisphere, but the grass is bright green and the flowers are blooming. The park has lots of great walking paths, statues, and a large fountain in the center. 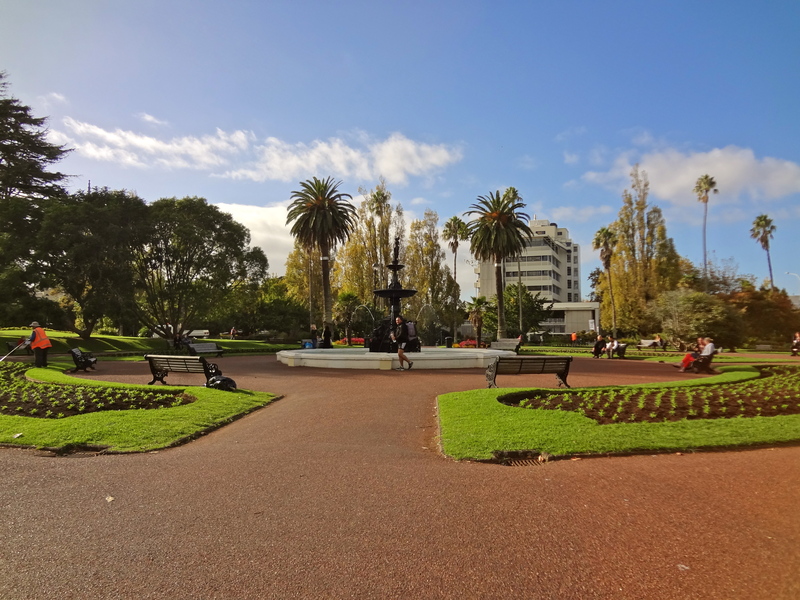 On that particular sunny morning, the park was filled with lots of students from neighboring University of Auckland. 4. 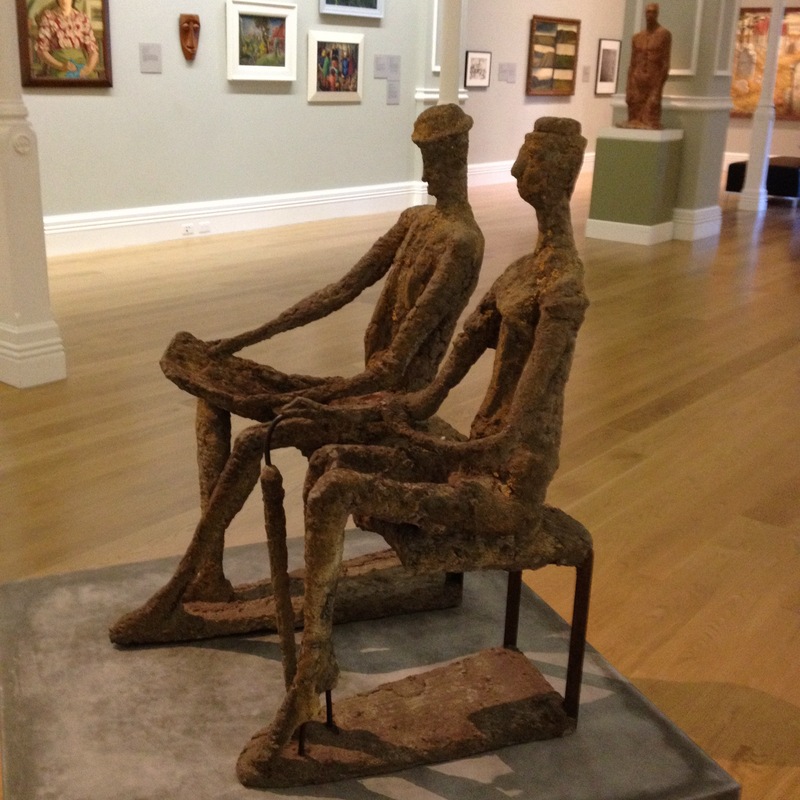 Check out all the cool art at The Auckland Art Gallery Toi o Tāmaki. Founded in 1888, the Auckland Art Gallery houses the largest collection of national and international art in New Zealand. The 15,000 pieces of art include everything from historic to modern, and includes traditional Maori works. 5. 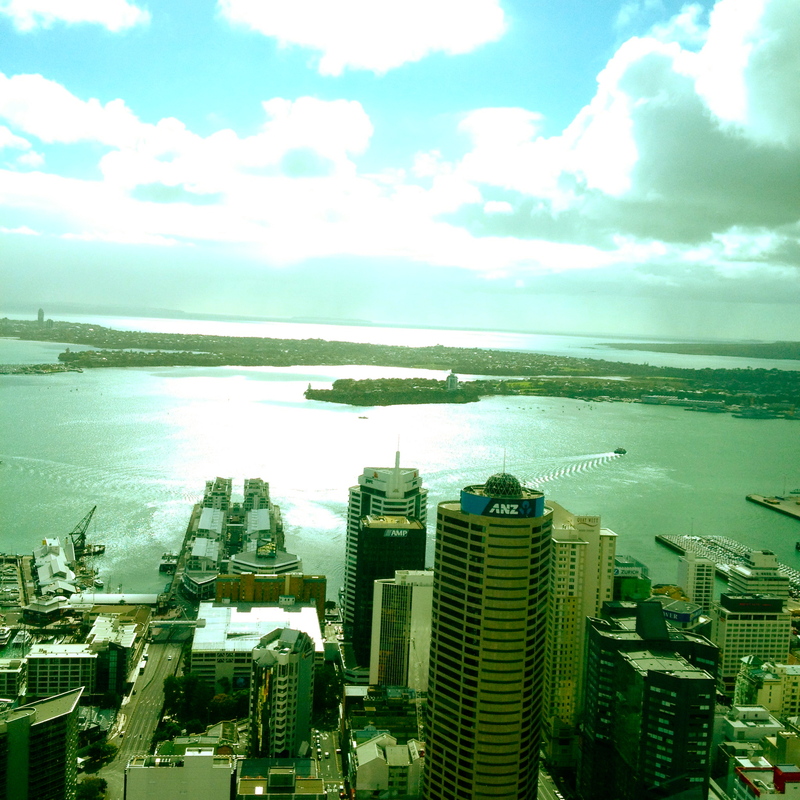 Get a bird’s eye view of Auckland at the Sky Tower. At 1,076 ft (328 meters), the Sky Tower is the Southern Hemisphere’s tallest free-standing structure. With a glass floor and windows, even the elevator ride up is part of the fun. In addition to the 360 degree views, look out for the bungee jumpers! Getting back to the airport was just as easy. Since my connecting flight boarded 45 minutes prior to departure, I allotted 2.5 hours for the entire return process, but I ended up having loads of time to spare. There were several well-marked Express Bus stops in the city, and buses arrived every 10 minutes. The ride back to the airport was also 45 minutes, with no traffic in sight. Since I already had my boarding pass, I simply had to go through security and customs, which again, took only minutes. They run a very efficient airport in Auckland! Extended layovers can be a great way to see a city. Next time you book a flight, consider a layover as a creative way to explore a new destination! Pingback: Auckland Waterfront « Lab to Fab! Pingback: SKYCITY Auckland « Lab to Fab! Pingback: Choco Pies, socks and sandals, and Spam sandwiches: random scenes from Hanoi International Airport « Lab to Fab! I have a layover in Auckland myself in a few weeks and am looking for ideas. So thank you for this! How early did you get in? I’m trying to project how long Customs will take so I know how much time I have in the city. My pleasure; this seems to be one of my most popular posts! I got in very early; about 6am maybe? The whole process was very fast. Let me know if you have any more questions! Thank you for this post. I am flying from the US to Auckland in a week and a half and I have a 9 hour lay over. My flight will be landing in Auckland at about 6:30 am. My question to you is, did you have to have any additional visa to enter the country? This will be my first international flight, and I’m a little nervous but I would really like to make the most of my layover. Hi Rachel! Thanks for checking out my blog; glad you found this post helpful. For starters, congratulations on your first international trip!I think Auckland will be a great first stop for you because it’s an easy airport to navigate, and the city is safe and has a laid-back vibe. I did not need a visa for my layover because my next stop was Australia. Depending on your travel plans, you may need a transit visa. You can find more details here: http://www.immigration.govt.nz/migrant/stream/visit/transit/. Feel free to ask if you have any more questions. Have a wonderful trip and please stop back and let me know how it goes! Amazing tips and I love the photographs. I will be heading to Australia from LA, in late August, with a 9 hr layover in New Zealand so I really appreciate your post. I will be sure to follow a few of your suggestions and let you know if I come across anything interesting while I am there. BTW I am a native NY who has been living in Seattle for 8 months, so I am all about transplanting. Hey Taquia, it’s always nice to hear from a fellow (former) New Yorker! Australia and New Zealand… you are in for a wonderful trip! I’m glad that you liked the photos and tips, and that you’re going to explore during your layover. I love hearing back from blog friends, so please stop back and tell me about your experience! Very helpful! I will have a 10-hour layover before continuing to the Cook Islands in May. I’ll just have to make sure to bring one warm outfit. So glad that you found this useful. Check back in and let me know if you have any more layover tips for Auckland! We have a short layover in New Zealand. Will we need a visitors visa or did you for your longer layover. Thank You. Our next stop is Australia also. You’re welcome! Enjoy your trip and let me know what you see during your layover in NZ!